User reviews are valuable tools for retailers; we encourage them at NeweggBusiness, and read them anywhere they can be found. Naturally we monitor Spiceworks discussion boards pretty closely. One particular Spiceworks thread titled “Best cost/performance SMB network switch” caught our attention. Here we cross-reference Spice-heads’ recommendations with our own reviews—adding in a few other useful resources— to present a case for the best cost-to-performance network switch for SMBs. The SMB specification here will apply to a setup capable of supporting 30-40 users. 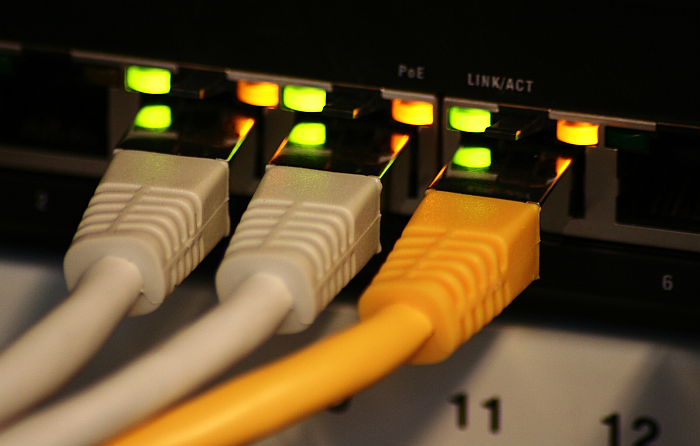 Network switches will have two small form-factor pluggable (SFP) ports, and a high-bandwidth port used for connecting to another switch or similar networking device. SFP ports help make a switch scalable, meaning if a company grows, the network can too, simply by adding to—not replacing—existing equipment. Additionally, they may or may not be Power-over-Ethernet (PoE) models; if they support PoE, they do not need to be plugged into a power source. Pricing usually depends on the number of ports. Generally you’re looking at $250-$300 for 20 ports without PoE support. PoE models cost more, but if you’re planning on using your switch for Internet telephony, it is a nice feature to have. If you are unfamiliar with small office network setups, learn more here: Networking Basics: Tips from the IT Team. The Cisco SG300 series received the most mentions (five) of all models. The Cisco internetwork operating system (IOS) programming language is generally well-liked by network administrators. Spice-heads cited good reliability—something that our users have echoed as well.We are seeing mostly five-egg reviews on all models: 20-port, 52-port, and 10-port. Note that the SG300 is not a PoE device. The Cisco SG300 utilizes Layer 3 switching. Without getting too deep into the Open Systems Interconnection (OSI) model, Layer 3 IP routing helps virtual local area networks (VLANs) communicate without degradation of performance. In short, this helps VPN users get fast, secure remote logon sessions that administrators have more control over. You will want to make sure to make sure the firmware is updated to the latest version, and Cisco has specialized support available for this. There have been some complaints that the graphical user interface (GUI) software runs slowly on some networks. Users recommend running all commands through the command line interface (CLI) to remedy this. Administrators generally like that they have both GUI and CLI features available. Cisco’s lifetime warranty for its switches have always been a key selling point for business use—naturally this received several mentions among NeweggBusiness and Spiceworks users alike. Spiceworks users gave multiple mentions to HP models as well. The HP ProCurve series received three mentions; the model geared toward SMBs is the ProCurve 2915. This model has Layer 2 support which means that the VPN access is more basic in terms of performance and control. It is a PoE device, which means it does not need to be plugged into a wall socket, which is a handy feature if a network sprawls over a broad office space. It has a manufacturer warranty period of three years. The HP v1910 series received two mentions as well. This model has Layer 3 support for VPNs and is PoE ready. Our users note that its PoE output gives them plenty of headroom to run VoIP. Spice-heads like the solid build and the simple GUI—one user says he has deployed roughly 100 in his network without a single failure. Generally speaking, HP models will come in priced a touch lower than comparable Cisco units. There is palpable excitement about Ubiquiti’s entry into the switch market; Spice-heads give the thumbs-up to their routers, which have consumer-level price points and packet speeds on par with business-class routers. Check out our user reviews on the ERLite-3 Edgemax EdgeRouter—we are saying the same thing. Here is their Layer 3-supported PoE model, the TOUGHSwitch ES-24 500W. We are awaiting our first review, so if you have one please let us know how you like it. It would seem that about half of users don’t have a problem having products from multiple vendors on their network, and the other half wouldn’t advise this practice. Just use common sense and run with the latest firmware updates, as this is how vendors address known issues that crop up as result of cross-brand networking. As with any IT purchase, the first step is to assess your business needs, and choose a product that best addresses these specifications. We hope that the information here, as well as the information on our product pages and users reviews, can aid in selecting the right network switch for your company. Let us know in the comments—which network switch do you deploy?